On behalf of the organising committee of FOSMC, a big 'thank you' to everyone who was involved in or supported the open day at the church in June. Altogether from the fete, music evening a total of some £1500 was raised towards the continuing projects to restore and improve the church. The next event at the church is on Saturday 14th September. That day, which coincides with both the national Heritage Open Days (this year on the theme of 'young people') and the Wiltshire Historic Churches Trust sponsored cycle ride, the church will be open from 10.30. St Mary's will be host to a meeting of the Young Archaeologists Club (North Wiltshire branch). The YAC will be investigating the church and its graveyard, and looking at how a study of the building and its surroundings can help us to understand the history of the town. Some years ago (does anyone remember when?) an electric pump was fitted to the organ, and the graffiti tail off, bringing to a close one chapter in the 'unofficial' history of the church. Removal of the organ has opened up the North chapel. The foundations are believed to be the oldest part of the building, and are on a different alignment to the rest of the church. The space is now far more accessible and potentially useful. The parish is now considering how best to restore this intriguing space for use. Please do take the opportunity if you are in the church to have a look - there is plenty that needs doing, not least to restore the arch that connects the chapel to the North aisle, where the confessional is sited. This is currently supported by timber bracing (possibly 1960's? - does anyone remember when this was put in?) but a more structurally sound solution is needed. This, and the work to restore the North wall damaged by movement of the foundations will form the focus of fund-raising and grant applications for some time to come. Mary's via the web. He was writing from Grand Rapids, Michigan, in the USA, looking for details of his ancestor, one Alfred Fawkes Herring, born in Cricklade c.1834. If anyone has details, or might be related, I'd be happy to put you in touch - let me know. All told, David has provided us with a site to be proud of. Please note that the Annual General Meeting of the Friends, open to all members, will be held this year at 7.30 p.m. on November 12th (after 7 p.m. Mass at St Mary's). The venue and further information will be sent out nearer the time. David was born in Cheltenham in 1937, and first went to school there at St Mary's Convent, now St. Edwards. His father was in the RAF and when he was posted overseas it was decided that David would go to Prior Park boarding school, then based in Bath. He had been there for one term when the Manor House in Cricklade was bought for the school and the youngest thirty boys, including David, moved to the new Prior Park school in Calcutt Street, Cricklade. Before its purchase by the school, the Manor had been very homely. David remembers an indoor 'garden room' upstairs with two swings and all the walls painted as flowerbeds. The painting had a three dimensional quality and was very real. This indoor garden room was left for years until it had to be painted over, having fallen into disrepair. The room now used as the school library was then the school chapel. Some pews for this chapel were given by the vicar of St. Sampsons. When David was seven he helped moved these pews from St. Sampsons to the Prior Park chapel - it took about twelve boys to carry each pew. Smiling, David recalls how, twenty years later, he helped move these pews again from Prior Park to St. Augustine's Chapel (now the Museum) after Cricklade's Catholic community had purchased St. Augustine's. David boarded at Prior Park as in those days there were no day places. Joan O'Leary taught him and his two brothers. Nurse Kelly, also a long-standing member of the Cricklade Catholic community, cared for them and particularly remembers his youngest brother. David remarked how this continuity and 'connectedness' was really nice: "There is almost a family ready and waiting in Cricklade," he said. From school, David became an engineering apprentice. He did national service in the R.A.F during 1958 - 1960, serving on the east coast at Coltishall, near Norwich and Yatesbury near Calne. He felt that National Service was a terrific opportunity for young men to broaden their horizons, especially if they had not been away from home before. He was seconded to the Navy where he learned about guided missiles. He and some others were posted to Australia with only three months left to serve. They got to Germany and then were sent back when this was realized. 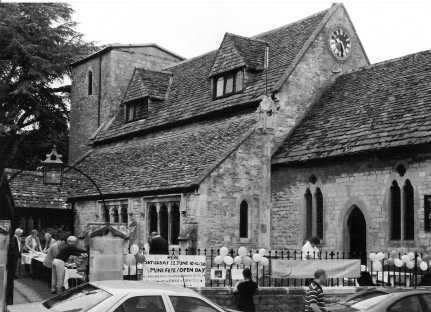 Father O'Donnell of St. Peter's, Cirencester bought the former Baptist Chapel of St Augustines at auction in the early 1960s. In those days the Baptists were not eager to sell the Chapel to Catholics and so someone else bought it on the behalf of the Catholic community in Cricklade. The neighboring cottage on the High street side of the Chapel had to be purchased as well as the chapel and the purchaser had then to demolish this cottage as it was unsafe. The cottage cost £225-00 and the chapel cost £302-00. For some years after, a parishioner, Mr Bourne, cut the grass at St. Augustine's. One day Father O'Donnell said to David "You live quite close, do you have a lawn mower?" This was in 1975 and David said "I don't mind doing it for a few weeks." He's been cutting the grass and taking care of the grounds first at St. Augustine's and then at St. Mary's ever since. teaching order based in Liverpool. They acted as sacristans and kept the Host in Prior Park chapel. In St. Augustine's there were four electric heaters which were put on at 7.00 o'clock in the morning ready for Mass, although even by 9.00 o'clock it was barely warm. At St. Augustine's David lifted all the gravestones and placed them along the wall of the chapel as some of the gravestones were leaning badly. First he put up a notice to see if there were any objections and to let the relatives of those interred here know of his intentions. No one objected and, as David was doing shiftwork at this time in Swindon at Metalbox, he was often there for part of the day and people seemed to be quite pleased that the gravestones should be nice and tidy. Father McGlinchey was eager to purchase St. Mary's when it came up for sale in the early 1980.s. It was advertised "For sale or let as a Warehouse." David kept this hand-painted sign feeling it to be important one day as a part of St. Mary's history. David remembers the people of the town being so pleased St. Mary's was saved from being a warehouse - "our own little reformation." Father O'Donnell was concerned whether it would be financially possible, whether the Catholic community could afford the initial repairs needed. Fortunately Father McGlinchey was a gifted fundraiser. David reflects how extraordinarily lucky the Catholic community in Cricklade has been to have the gifts of so many people and priests, always at the right time too. The Bishop came to the opening of St. Mary's in 1984. David transferred his mowing. Before the Catholics took over there were only two services in St. Mary's a year and the weeds had got very high, waist high in fact with an eight foot buddleia etc. Rev. Ken Withington agreed with the Town Council for there to be a bit of a project where the Rangers came and cleared a lot of the weeds so it was now possible to at least walk around and for David to get his mower in. Ken Withington said the only thing he would miss from this whole affair (he lived next door) was the loss of the log shed. This was an air raid shelter that had been built into the Church. It had a roof of concrete, stone walls and a wooden door. Moore's the builders demolished it. (Possibly it had been a pillbox, being in a good strategic position with a square loophole overlooking North bridge - Ed). At this time St. Mary's' interior smelt like an old car and smiling, David recalls if every member of the congregation had sneezed at the same time all the plaster would have fallen, it being that crumbly. Everyone was very keen to get St. Mary's clock going. Joe Robinson, the father of John Robinson the plumber in Cricklade had wound the clock from the age of fifteen until seventy- three when he could no longer climb the ladder into the tower. Joe Robinson warned David about the danger of over-winding the clock. David remembers gingerly winding the clock, the weights crashing and there being a clang as the wire parted. Paul Linsey, a member of the congregation who worked at RAP Lyneham, got some aircraft cable to replace the broken wires. David scrubbed, sprayed, cleaned and oiled the clock. There were a few 'teething problems' - on one occasion the clock was over wound, sheering the brass teeth off. The apprentices from RAF Lyneham again came to the rescue. 1985 -1986 there is a photograph taken by Mr. Giles wife (they lived opposite the church) of David and Peter Baister standing on the apex of St. Mary's roof as they removed the clock face for repainting at RAF Brize Norton in one of the paint shops there. David remarked how important the Catholic community is to the town. 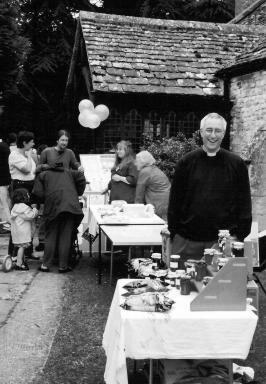 Whilst cutting the grass at St. Mary's, often of a Saturday, David really enjoyed opening the church for visitors - getting the key first from Blackwells and then from Beryl's Florists in the High Street. Mr Ramsden Binks told David about the Sundial on the church wall near the cross and how people used to put pegs in the holes in the wall to denote church service times. David keeps the hedge quite high in St. Mary's church yard where it adjoins neighboring properties, partly as a protection for the neighbors (as Blackwell's had all their gas bottles stolen when the hedge was cut quite low) and partly to give neighbors their privacy, which in turn enhances the tranquillity of St. Mary's churchyard. One last thought as David was leaving: "Don't write anything too glowing about me - I only mow the grass. "